A beautiful 81°Fahrenheit and what a relief from the three digit temperatures we have been experiencing over the past weeks. It’s the perfect weather to give some TLC to my garden. Look who I saw visiting! A little shy at first it seems and flew here and there before deciding to taste some nectar. This is indeed a swallowtail butterfly. When this visitor first entered the garden he/she decided to taste some water from the wet concrete and grass instead. Then on to the moist mulch. 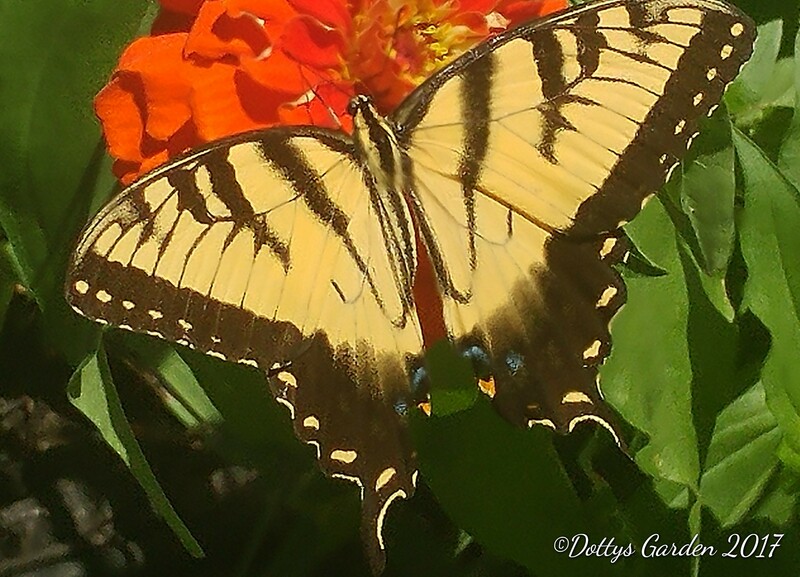 The red, orange and yellow zinnias were begging to offer up a drink of nectar but for some reason he/she flutter here and there and everywhere else. Passing up the butterfly bush he/she hovered over the fence to the backyard and back again, like an aircraft circling to land. With camera in hand ready to get a good picture I chased this beauty around for a while. Then finally he/she landed on the zinnia for a nectar drink. It must have been appetizing as he/she lingered for a while. This beauty has large wingspan wings, yellow and black with blue and orange color near the tail. Notice the extensions on the hind wings that resembles a swallow’s tail. 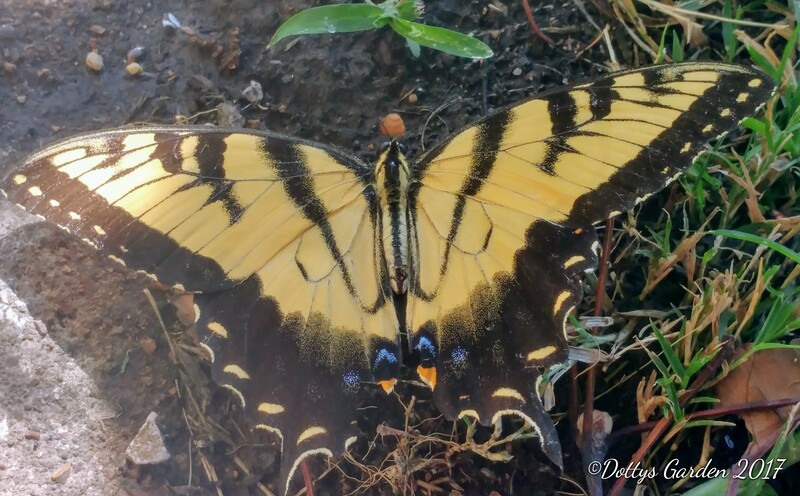 Is he/she a Western Swallowtail since he/she is visiting my Midwestern Garden? The Western Swallowtail and the Eastern Swallowtail looks so much alike. Not sure what the major difference is. With excitement I thought if one comes to visit then soon I will have plenty more visiting. 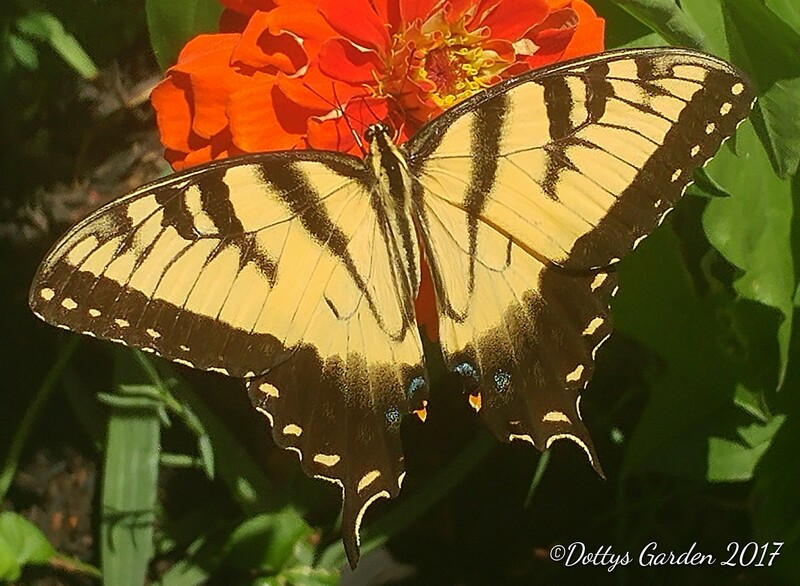 I am already planning for next year garden and planning to grow a lot more butterfly enticing treats for my visitors.